People love them or hate them. Few things in cycling stir as much debate as bike paths (well, besides helmets and bike lanes). Proponents see them as the safe, fresh-air way to avoid the marauding automobile. Those opposed find them to be treacherous and inconvenient. 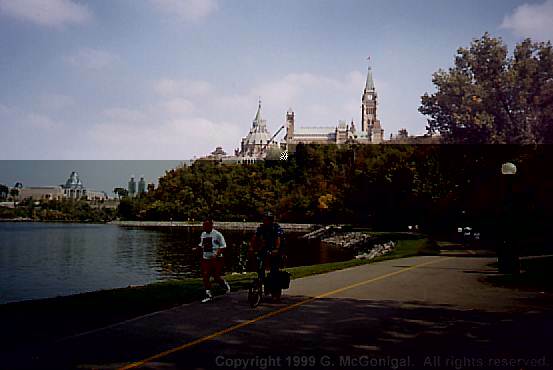 A week in Ottawa -- a "poster city" for bike paths -- allowed me to experience both sides of the argument. My reason for being in town was the Canadian Environmental Network's Annual General Assembly. This was held at a YMCA camp on the Ottawa River, north of Kanata, west of the city. Rather than brave the spartan lodgings offered at the camp, I opted to stay at my brother's house on the west side of Ottawa, in the midst of the grotesque suburban sprawl near Carling and Woodroffe. All the better to sample the bike paths during three days of commutes to the conference. At first I took the bike paths as much as I could. Initially I had some trouble finding my way, as not all bike path intersections were marked. Some had convenient maps showing you where you were, but not all. Another gripe I had was that where a bike path crossed a street, the name of the street was not signed. All of these paths on this route were very narrow, perhaps 6 feet wide. Enough room for 2 bikes to pass, but a bit dicey when trying to pass a ped (especially if they didn't hear your bell) and their dogs. The surface of the paths varied. Newly paved paths were fine, but many were bumpy, making one fear for one's kidneys. Some paths such as those beside Carling also had far too many cross roads and driveways, so besides being dangerous, they made for an uneven ride. Oddly, the best surfaces seemed to be on the crushed rock paths further out of town. Night riding was yet another story. Coming back I found many of the paths to be unlit. Even with my bike light I found this to be rather stressful. Also a hazard were rabbits that all seemed to run across in front of me instead of away. For the most part I opted for the safety of the street. By Sunday, the last day of the meeting, I'd given up on the paths that parallel Carling (too bumpy) and Corkstown Road (too winding, too many blind corners). The only path I used went from Moodie up to Defense Research. It was smooth enough and direct enough that it was actually convenient to take. The first day I had some bad experiences with drivers not giving me enough room on the road (especially out in the country on Fourth Line), but after that, Ottawa drivers seemed to be fine. My brother made a joke about the locals being impatient with bikes that weren't on the paths though. But I'm not sure how serious he was. Tuesday, after the conference, I took a grand tour to downtown. I found the pathway along the river to the Parliament Buildings to be useless. The surface was OK, but the peds and dogs were annoying, especially since the Driveway(?) was right beside it. In fact, the low-traffic Driveway had a perfectly smooth surface, and a better view of the river to boot. Close to Parliament the path became useless for commuting as it was full of peds around lunch time. The route became completely obstructed by hoards of sightseers near the Chateau Laurier. After lunching at the bustling Byward Market I headed back along a route that took me on the East side of the Rideau Canal, over a set of locks at Carleton University, through the Experimental Farm, and back to the house along a path parallel with the new busway. Again, the path along the canal was too bumpy and too full of peds and joggers, so I switched to the road. The route through the huge experimental farm was interesting. It began on access roads (where I promptly got lost) and then continued on the regular narrow bike paths. This is no doubt a convenient route for many from the university. Luckily, this route is too long for most walkers. 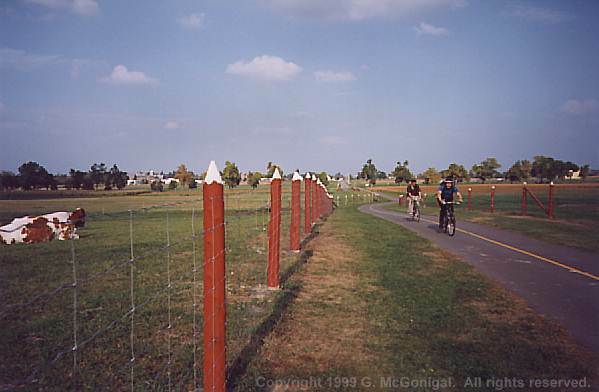 Bike path through the Agriculture Canada Experimental Farm near Carleton University. All in all, this visit has confirmed my general dislike of bike paths. For Sunday recreation they may be fine, but for a commuting cyclist who is reasonably comfortable sharing the road with cars, they are generally too slow and bumpy to be useful. Occasionally they do provide a more direct route, but that appears to be relatively rare. Certainly I think that any city should not stop accommodating bikes on their streets just because they are providing bike paths. And finally, on this trip I discovered one other reason why I dislike bike paths -- they hide us too much. Out of sight, out of mind. Without us on the roads, who will remind motorists that they could be cycling too?